Barnard College will not take action to divest its endowment from eight companies that “profit from or engage in the State of Israel’s treatment of Palestinians” if asked to do so by the Student Government Association, President Sian Beilock announced in an email to the college Monday. The announcement comes as a response to an SGA referendum that was included on this year’s elections ballot following a proposal made by members of Columbia University Apartheid Divest, who requested that SGA write a letter to the college urging them to divest from eight multinational companies that have ties to Israel. Of the nearly 50 percent of Barnard students who voted in the elections, just 741 students voted on the referendum, which passed with 64.3 percent of the vote. This means that less than 30 percent of Barnard’s student body voted in support of the referendum. Additionally, neither SGA nor the college is beholden to act on referendum results, which are not binding. However, Beilock wrote that because of the small number of students who voted for the referendum—as well as pushback from both students and alumni—the referendum does not meet those two requirements. “Taking an institutional stand amid the complexities of the Mideast conflict would risk chilling campus discourse on a set of issues that members of our community should be able to discuss and debate freely,” she wrote. Since the results of the referendum were announced on April 18, some alumnae have been vocal regarding their disappointment with the content of the referendum and the decision of some students to support it. As of Monday morning, more than 3,400 individuals had signed the petition including more than 2,000 Barnard alumnae. “At Barnard, we received an education that prioritizes intellectual honesty, social justice, and an impassioned search for truth. But this referendum, and the manner in which it was brought to a vote, reflects none of these ideals and instead silences and marginalizes a community on our campus,” the petition says. In protest of the referendum, some alumnae, particularly those who are Jewish or identify with the state of Israel and who have financially supported Barnard in the past, have said they no longer plan to donate to the college. Similarly, other Jewish alumnae who do not identify as pro-Israel have launched an email writing campaign urging Beilock to consider the referendum vote. In an op-ed defending their choice to add the referendum to the ballot, SGA’s executive board said that their decision stemmed from the concern that they could not vote on CUAD’s request without student input. “Asking the students we represent for feedback is not radical, and the executive board felt that any move to prevent a referendum would call into question the Representative Council’s ability to represent students,” they wrote. Some alumnae, including Jo Chiang, BC ’15, said they have already responded by sending their own emails to Beilock denouncing her response to the referendum. Chiang criticized Beilock for disrupting the student democratic process, and for assuming that students are incapable of facilitating productive discourse on campus. Yousr Shaltout, BC ’17 and a former member of Students for Justice in Palestine, also described Beilock’s statement as contradictory as well as dismissive of Palestinian students on campus and those who support them. Read Beilock’s full email below. I am forwarding a letter I have sent to the Student Government Association (SGA) representative council regarding the results of its recent referendum on whether the College should be asked to divest any holdings from certain companies doing business with Israel. While it is important that the students have the opportunity to discuss the issues at hand, it is equally important to provide students with clarity on the College’s thinking prior to SGA discussions taking place this week. I write to provide input on the referendum that the Student Government Association (SGA) recently conducted and to be transparent about the actions Barnard College will take with respect to any request related to this referendum. You are of course free to continue your discussions on this issue, but it would be misleading to not provide you with clarity on the College’s thinking prior to the SGA discussions on this topic that I understand will take place this week. For any referendum related to Barnard’s endowment to be considered by the Board of Trustees, it should meet two exacting standards. 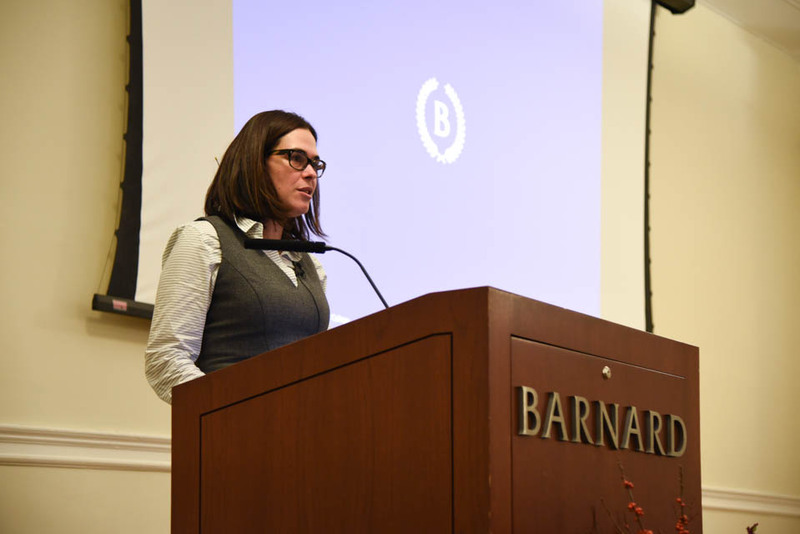 The issue under discussion must relate directly to Barnard’s mission, and there must be a clear consensus across the Barnard community that the recommended approach is the best means to address the issue at hand. The referendum you are currently considering does not meet these two standards. First, taking an institutional stand amid the complexities of the Mideast conflict would risk chilling campus discourse on a set of issues that members of our community should be able to discuss and debate freely. Choosing a side therefore would be inconsistent with our mission. Second, there is clearly not consensus across the Barnard community on whether or how to address the issue. While a majority of students who voted support the referendum, this is less than 30% of Barnard’s student body. Thousands of alumnae have also voiced their opposition to the referendum. For these reasons, Barnard will not take action in response to this referendum. It is imperative that all of us at Barnard work hard to foster a community in which difficult topics can be discussed in an environment free from fear and hate. I urge you to consider how SGA can best foster civil discourse moving forward across a range of complex issues so as to allow for the highest quality education and scholarship on our campus. I wish you continuing success with your important work. Valentina Rojas Posada contributed reporting.